Learning Shiatsu Shin Tai via Video - Is it effective? After almost 40 years of teaching, Saul has begun to offer some online video classes for the first time. Why now? Shin Tai International launched its online teaching classroom in the spring of 2016, and many bodyworkers have taken advantage of getting some Shiatsu/Shin Tai training in this new way. There were several factors that led to the creation of this online venture, and we thought it might be interesting for you to read a little about why and how we decided to do it. After almost 40 years of traveling to teach Shiatsu/Shin Tai, Saul decided to stop. He wanted to spend more time at home to be near family and to delve into certain projects that require deep immersion. Then, the shiatsu school that he used to own and has taught at here in the states for a very long time began transitioning to another location. In the midst of these changes, people kept requesting classes with him and we had to keep saying no :(. Saul is still teaching some classes here in the states. And many Shin Tai enthusiasts can go to live classes with other excellent instructors in the US and Europe. But many of these wanna-be students can not get to where the classes are. I love Shin Tai and I love Shin Tai classes, even after attending almost every one Saul has done for over 20 years (I'm Lynn, Saul's wife). I know that this bodywork helps people experience more vitality, balance, and fulfillment. I know many other bodywork practitioners felt the same way. I wanted to find a way that could allow more people to learn shin tai, so that that they could benefit from its unique capacity to invigorate health and consciousness. But we had to find a way that did not involve traveling, and that would allow Saul to spend less time in the classroom and more time delving into the development of new material that has been gestating for awhile. Thus was born the online Shiatsu Shin Tai teaching classroom. Can Shiatsu Shin Tai be taught through videos? The answer is yes.... and no. We had concerns that bodywork could not be taught through videos. That students had to be in a classroom live in order to feel, understand and learn this often challenging and subtle material. We thought that maybe without working with classmates in-person, participants might not be able to learn the unique techniques and evaluation skills that are necessary in order to do shiatsu shin tai. But people kept asking for classes, and Saul did not want to travel anymore..... so..... we decided to try it out. So far the results have been beyond what we expected. Students who have enrolled in the courses are giving very positive feedback. Many seem to be surprised at how much they are getting from the videos and instructional materials. I myself have been almost shocked at how much I've learned during the countless hours editing all of the films. I simply did not expect that the powerful experience of live classes could transmit through the videos, but it does! And the fact that you can watch the videos over and over is a benefit you do NOT get when you take a class live. There are advantages to learning both in-person and through video. Below are some of the main points that we feel are most important. You get the benefit of giving treatments to people of different body types and conditions. You get to experience different practitioners practicing on you, which is a powerful part of learning this work. Without experiencing the effects of the bodywork personally, you can not truly understand how it works. In addition to that, receiving treatments helps your system become clear enough to expand your perceptual abilities so that you can use the techniques and theory in the most effective way. You get live feedback and assistance as you are practicing. You get videos and lectures that you can watch again and again. You have the benefit of learning directly from the developer of the work. There are accompanying written materials that are not normally provided in the live classes. Assistance is provided by way of an interactive comments section under each video and a private facebook group that shares experiences and questions. Some people find it easier to focus in their own environment, without the distractions of other students. Many people are choosing to combine doing the online work while they study with an instructor in-person. It is also common that students who have previously taken live courses enroll in the video modules to supplement their knowledge and skills. Massage and shiatsu therapists that have never studied with Saul are taking advantage of getting some training even though they have not studied Shiatsu Shin Tai with an instructor in-person. Some shin tai instructors and students have taken both live courses and the video modules. It really is a choice of what works for you logistically and what your learning style is. We recommend that serious Shin Tai students supplement the online video courses with live courses. To find other Shin Tai instructors, please go to: http://www.shintaiinternational.com/teachers/. What online classes are available? There are presently 6 online courses available. Five of them are are shorter modules (equivalent to about a day of classroom work), while the class Shiatsu Techniques of the Masters is equivalent to a 3 day live class. Excerpt from Online Course called "The Spine"
Saul Goodman discusses the vibrational meaning of the names Shiatsu and Shin Tai. This lecture is from a Governing Vessel & the Spine class at the International School of Shiatsu in Doylestown, PA, USA. The Foot Arch Release technique is often covered in the Governing Vessel and Conception Vessel courses. It is a wonderful technique that we use often in treatments. It is recommended that you use this instructional video as a supplement to classroom instruction, not a replacement! This technique can be used on its own, or as a preliminary step to doing work with the hip joints that is presented in the Conception Vessel/Hara class. It is best to do this technique once there is already some space and motion in the body. In other words, don't use it as one of the first things you do in a session. 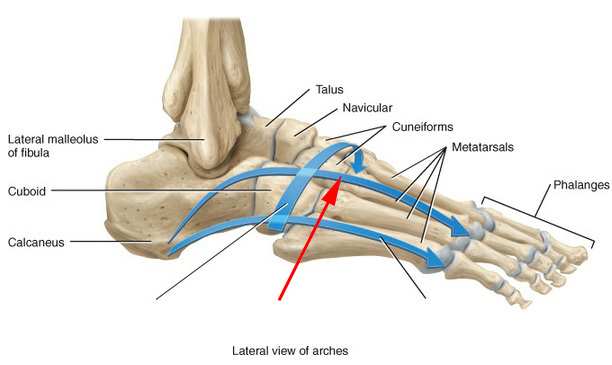 There are three main arch structures in the foot: two longitudinal arches and one transverse arch. Due to injury, repetitive compression, energetic imbalances, or organ disharmonies, the joints creating the arches in the feet can become rigid, misaligned, and/or compressed. This technique creates a secondary affect in the hip joints. Energy that tends to become trapped and stagnant in the hip joints is given release through the muscle and ligament chain that connects down through the foot structure. Creating more space, bouyancy and alignment in the foot arches with the release technique allows this trapped energy to dissipate and disperse. There will be an immediate improvement in hip joint flexibility after this release. The ankles are a reflex area for the pelvis. This also helps explain why freeing up more mobility and alignment in the ankles is reflected in the increased range of motion in the hip joints.